This is another of my quickie "non-recipes." A "non-recipe" because I'm really just opening cans. But hey, even if I used fresh fruits, it would still only be a matter of chopping them anyway. I'm not sure what other people would call this. It's just something that my family threw together as a quick dessert or cool-down snack during the summer. The "delight" in the name comes from one of my college friends. During one of our VSA (Vietnamese Student Association) movie nights, we served food to the non-VSA guests. I don't remember what was served. Come to think of it, I don't think I was there because I had a night class. My friend, in retelling the story, said the guests loved the dessert so much they kept asking him what it was called. So he came up with tropical fruit cocktail "delight" because it sounded catchy. And so it is. 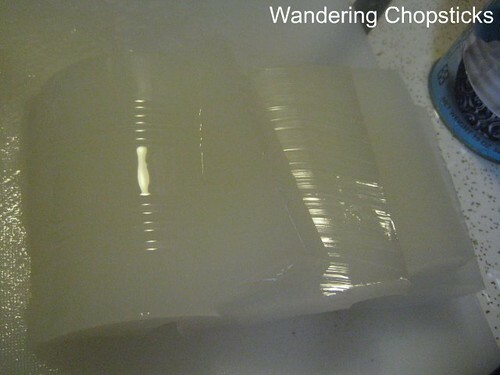 I like the contrasting flavors of the lightness of almond jelly with the grassy notes of grass jelly. Toddy palm or palm seed has a nice crunch. Robyn of Eating Asia has a great post about how palm seeds are harvested. I prefer longans over lychees precisely for that crunch. 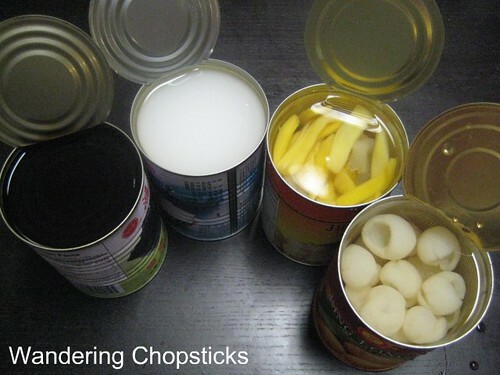 This is a great way to try all those canned tropical fruits at the Asian grocery store that you've always wondered about. You can also add more typical fruits like peaches or pears if you like. 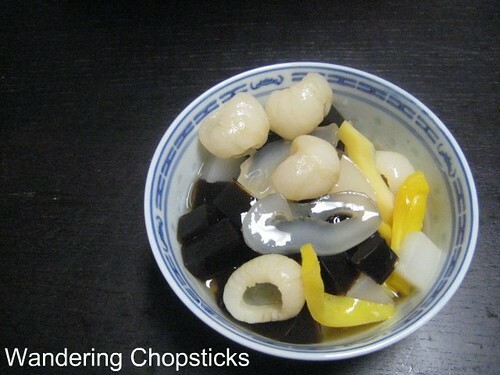 The only caveat is that if you plan on using grass jelly, to add that just before serving as it'll stain all the fruits black and that won't look very appetizing. The jackfruit and palm seed are already cut into strips. 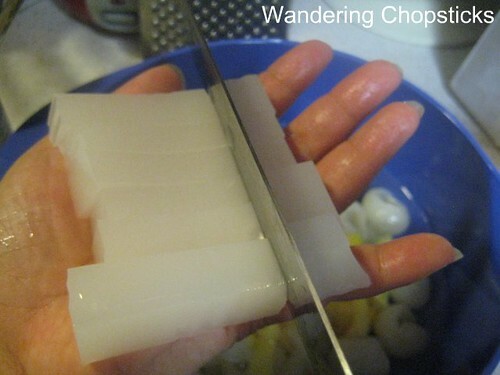 So you'll only have to slice the almond and grass jellies. 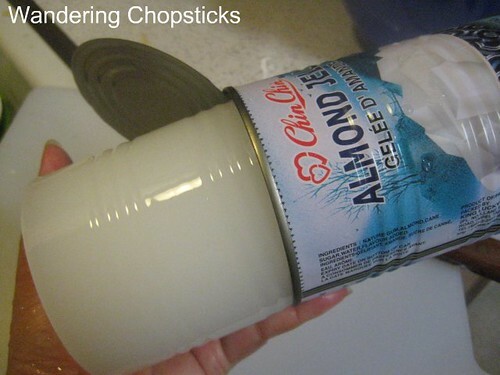 Slide the almond jelly out of the can. Now, you can certainly continue cutting on the chopping board. But I usually take one sheet of jelly and place it on my hand. Then I cut it into lengths, then crosswise into big dices. Or into a bowl because I know you'll want seconds. And if this "non-recipe" offends your cooking skills, you can also try my Sweet, Sour, Salty, Spicy Tropical Fruit Salad. I'm submitting this recipe to No Croutons Required, a food blogging event alternately hosted by Lisa's Kitchen and Tinned Tomatoes, celebrating vegetarian soups and salads. The challenge this month is to make a soup or salad with fruit. 1 year ago today, buttermilk biscuits from homemade buttermilk, a by-product of my homemade butter. Wow, we do this in our home too! 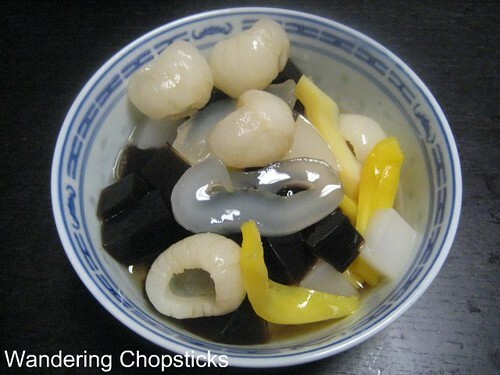 Except we leave out the almond jello and put in nata de coco and we sometimes use the green grass jelly instead of the black. We just call it "cocktail". 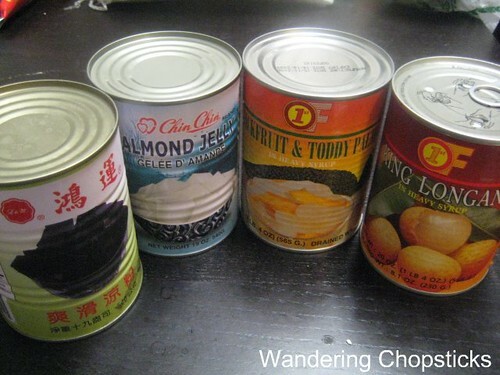 interesting, i didnt know they had almond gelee in a can. i always get the coconut jelly (thach dua) in the glass jars! We make this in our family too! So easy and refreshing. But I'm just like "j" above- we never use the almond jello but we do the green grass jelly sometimes. And I like adding rambutan as well as one of the fruits! I am a beginning culinary student, and for one of my classes I have to come up with a menu, and it has to have recipes for everything on it. Well my theme is Asian Fine Dining. But I want to focus on a lot of korean food, b/c I am, and a lot of people don't know much about korean food and how delicious it is. I know its going to be tough trying to transform korean food into fine dining masterpieces but i believe that i can do it, but I also want to feature other asian cuisines, and i had some questions for you b/c i've been following your blog for about a year and you always have so much food on here, and some great recipes, but I need a cold asian soup recipe...and maybe a dessert, any country of origin that is asian...do you have any suggestions? 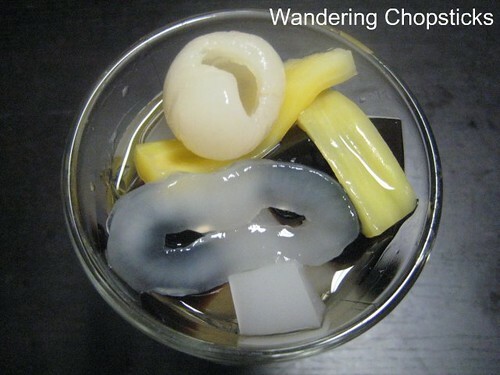 i don't know why but my family always thought of this as che thai but i don't think i ever had the almond jelly before only green grass jelly. but i made it w/ mango jelly before also. but for it to be more like che thai i usually add half and half or creamer to it. but it almost looks like there is no or very little liquid in there. which i could eat everyday! Thank you for entering your salad WC! I am particularly intrigued by the jackfruit. WC: Greetings from Canada! We used to eat this also but it's been a LONG time! I had completely forgotten about almond jelly until now, but just seeing the words, I can imagine the almond fragrance. I'll have to pick some up today!! I think a lot of Asians do this, but I didn't want to make assumptions. I think most people do just call it a fruit cocktail. Yeah, a lot of these fruits are more SEAsian. But you gotta experiment with food if you want to be a chef! Cold Asian soup and the first thing I thought of was naengmyun. Can't believe that slipped your mind. You should ask your mom for her recipe. ;) For VNese desserts, just look in my recipe index. There's VNese cold dessert soups too if you want to do a whole soup theme. The sugary liquid in the cans is too much for me. I try to limit my sugar intake when I can. Cold fruit is so great to eat in the summer isn't it? You know, I've never been one to add cream or milk to my fruit cocktails. Probably why I don't order che Thai at the store either. I think people get a little crazy over the size of jackfruit. Then there's that outer skin and all those tendrils concealing the fruit. Welcome back! Glad you made it safe and sound. Can't wait for your food blog to start! I didnt' know there was another J! Alright I guess I have to change my name from J to DocJ to distinguish myself. My family also make this..but we like to add a can of basil seed drink and some half and half...we call it che..but like u said, seems like there really isn't a name for it. There's at least 3 of you! I like basil seeds too. Cools your body in hot weather. We skip the dairy in my family. hmmm yum-o. we add coconut milk, condense milk, tapioca, and papaya to ours.... delicious! I want to run out to the Asian grocer to get the ingredients for this!! I think it's called Che Thai? Mainly because you add milk as the main "drink" with the fruits for added variety and flavor. Yeah, no milk in this version.